Tom Stoppard knows how to write a play. But although I have read his plays and watched his TV series and films, up until Monday night at Leeds Grand I had yet to see any of his plays performed live. 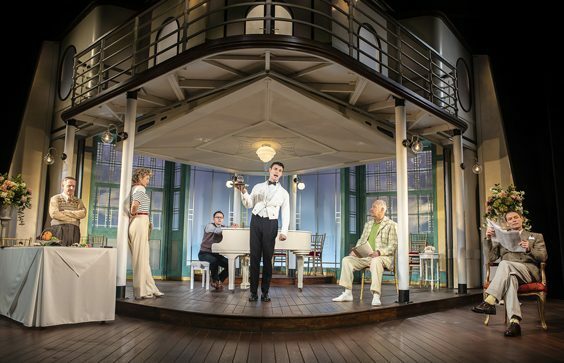 Rough Crossing is a musical comedy set aboard a luxury liner in the 30s. The set awaits us as we enter, an impressive two tier view of the starboard side, as we later discover. Decadent in its 30s glamour, all art décor and silver with a sumptuous velvet couch, identifying it as the inside of a luxury cabin. We anticipate the start of the play with the sounding of the deep booming horn. First performed in 1984, this latest revival is docking throughout the land. 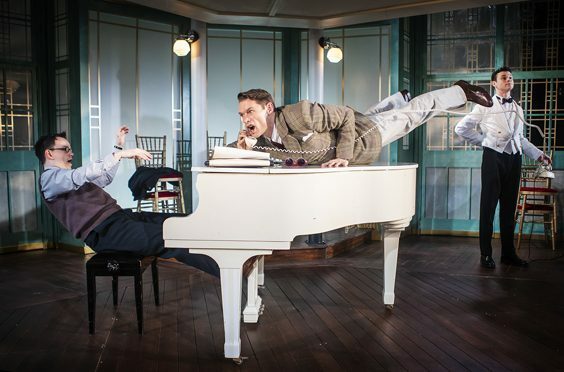 It is freely adapted from Ferenc Molnar’s Play at the Castle and has music by the late Andre Previn (forever immortalised by Morecambe and Wise “but you are playing all the wrong notes!”), who was a good friend of Stoppard. 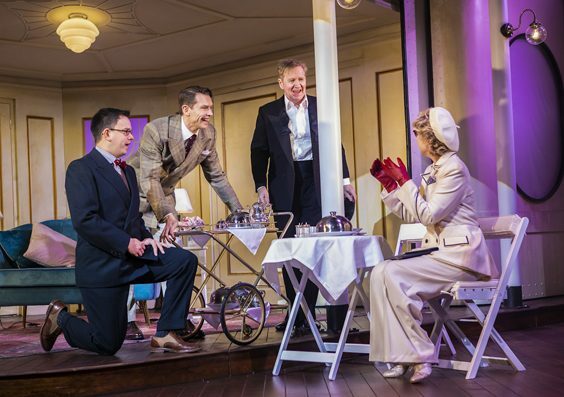 The seasoned John Partridge comes aboard, whom I saw a couple of years ago completely owning the stage in La Cage Aux Folles. He brings to life the character of Turai, but I was left feeling that he appeared a tad constrained in the role and that he was itching to break out into song and dance. His role was physical in places and led to interesting visuals. I am sure he enjoyed the dance routine at the end where we get to see him use his undoubted skills to entertain the audience. The cast members delivered a competent performance and brought the play to life. The rest of the six piece cast include Matthew Cottle as Gal, the forever eating side kick to Turai, the pair of them tasked with finishing off a play they have started before the ship docks in New York. Simon Dutton plays the actor Ivor, whom had seduced the fellow actor Natasha, played by Issy Van Randwyck, some years ago when she was a unknown scarlet and they had embarked upon a love affair. Natasha is now a well known performer who is caught up in a love affair with Adam, played by Rob Ostlere, the nervous actor turned composer with a speech impediment that means it takes him longer than usual to converse, leading to some funny dialogue between him, Turai and Gal. Charlie Stemp had the opportunity to show off his movement skills, playing the green waiter Dvornichek, whom had yet to develop his sea legs. The plot involved Turai coming up with a cunning plan to convince Adam that Natasha and Ivor was actually rehearsing the play and not, as they actually were, talking about their love affair all those years earlier and Ivor trying to convince Natasha to rekindle it. This despite Ivor being married and Natasha in a love affair with Adam! I enjoyed the pace of the play which will have been tricky to direct and technically difficult. The first half of the play would be a test for any actor with Stoppard’s trademark overlapping lines. The play is considered absurdist. This production reminded me more of a well rehearsed choreographed set of word play and movement. In lesser hands it would be a dead fish but this production pulls it off. That said, despite the talented cast, the opulent set and the pragmatic directing, the first half dragged a little. The second half, however, picked up the pace considerably and was much more fun. There’s plenty of humour, and I found myself belly laughing in places. As would be expected with Tom Stoppard, there were a few “in jokes” and I don’t mind saying a few went over my head, but not the entire audience who were warm to the play, with one women laughing throughout. And when the big reveal comes, it is certainly worth the wait.